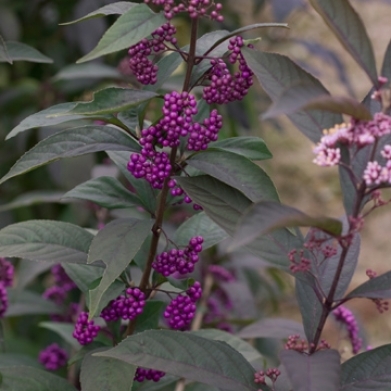 Callicarpa Purple Pearls makes a great addition to your cut flower garden, perennial bed, or mixed border. 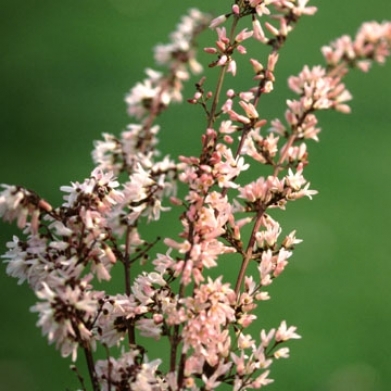 Features soft pink flowers, purple berries, purple tinged foliage. Plant is deer resistant. Prefers full sun and well drained soil. Plant can be pruned back in early spring. Height 4-5 feet tall. space 4-5 feet apart. Bright early spring flowers are great in mixed borders or cut flower gardens. Also good for hedging and mass plantings. This plant features big dark red double flowers that appear in early spriing. Drought tolerant once established, this plant may be pruned after flowering. Bright spring color. This variety is thornless, deer resistant, and does not set fruit. Plant in full sun in moist, well drained soil and fertilize in early spring. 4-5 feet tall space 4-6 feet apart. This is the best pink flower you'll find on a summersweet. Deep reddish-pink flowers don't fade to white, and their fragrance attracts butterflies to the summer garden. This deer resistant native plant has nice yellow fall foliage, too. 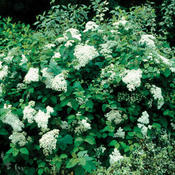 Best in moist soils, Height 3-6 feet, plant in sun or partial shade about 5-8 feet apart. Showy burgundy flower buds open to white flowers which may turn pinkish under cool conditions. Wine colored new growth turns wine/green when flowering; this plant will flower from early July to frost. Showy burgundy flower buds. Heat and drought tolerant, it is also mildew resistant. It flowers on new growth once days reach 85F+ for a sustained period of time. Broad, upright growth, reaching 5' or more in one season. Prefers moist, well drained soils. 10 - 12 feet tall, plant in full sun approximately 12 - 15 feet apart. 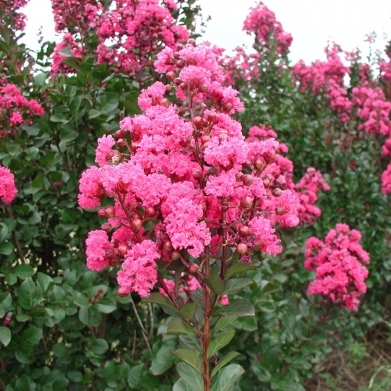 Flashy pink summer flowers and distinct dark wine foliage which peaks in the spring before blooming. Heat and drought tolerant; mildew resistant. Selected as a "2003 Oklahoma Proven" and winner of the 2007 Pennsylvania Horticultural Society's 'Gold Medal Plant Award.' Prefers moist, well drained soils. 10 - 12 feet tall, plant in full sun about 12 - 15 feet apart. an easy growing, bright beauty for the shady spot in your garden. 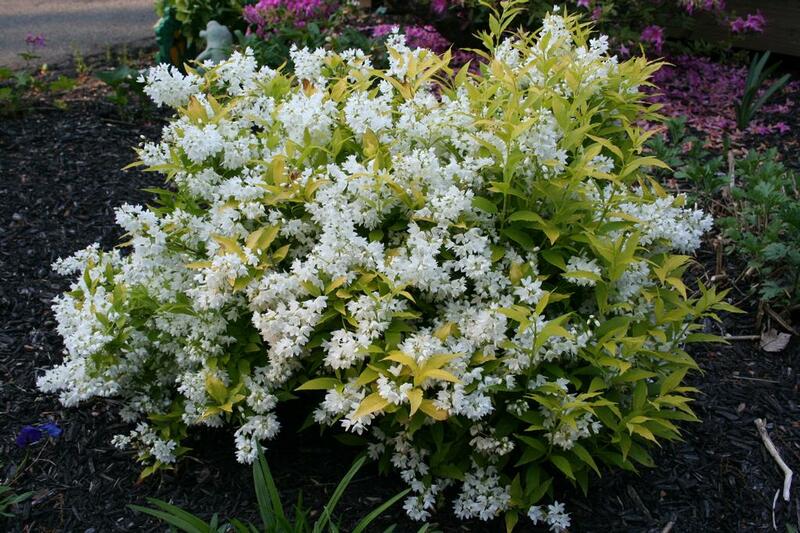 Numerous pearl-like buds bursting into attractive star-shaped fragrant flowers in spring. When the flowers have faded, this plant continues to shine with its bright yellow foliage. Growth is strong, but compact to create a wonderful small shrub that is equally at home in the shrub border as it is in a perennial one. Very cool! Use in place of dark green or purple foliage. Deer resistant, fragrant flower, compact only 20-36 inches tall with a 20-36 inch spread. 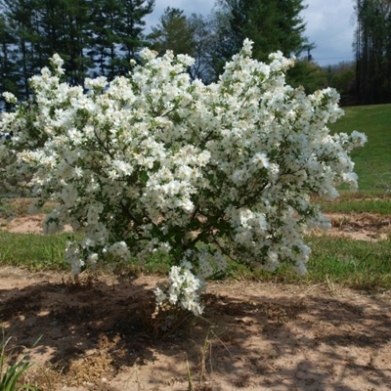 This shrub is a blizzard of pure white flowers in spring. 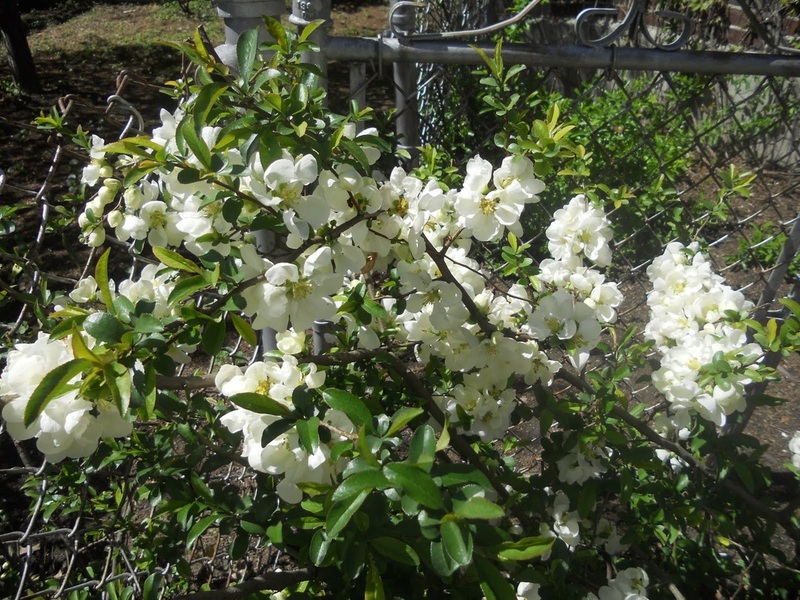 It has extra large flowers and can be pruned to keep small or trained into a small tree. Best planted in full sun and is adaptable to many soil types. Height 5-6 feet, plant 6-7 feet apart. 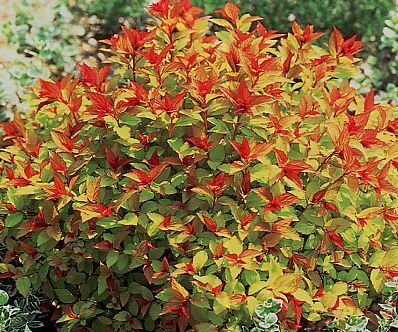 Fireball - Burning Bush - Compact, adaptable, and versatile plant, wonderful in the foundation garden. Green foliage throughout the season, pointy leaves turn an outstanding cherry red in the fall. The flowers are insignificant. The warty brown bark and harvest gold branches are extremely showy and add significant winter interest. about 6 feet tall and about 6 feet wide. 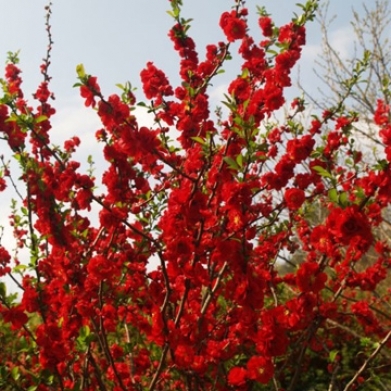 Flowering quince is a large early blooming shrub whose main merit is showy flowers (red, orange, white, or pink depending on the cultivar) in early spring. Uses include hedge, shrub, border, or mass plantings. Plants have thorns which should be considered when making placement. 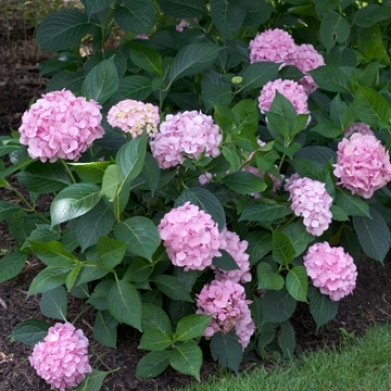 Full growth at 10 feet tall with a 12 foot spread, upright habit, plant in partial shade to full sun, will tolerate wet, moist, or dry environment and is not fussy as it will tolerate sandy, loam, or clay soil types. 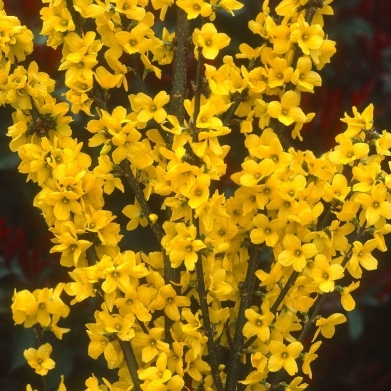 Forsythia is no longer one of those plants that needs heavy pruning; Show Off is a compact new variety with a spectacular flower display. In early spring it is full of blooms from the ground to the ends of every stem. While older varieties can get out of control, this little beauty will stay small so there is no need to prune. Now you can have your hedge – tight and compact the way you want it without doing any work. Adapts to most soil types. Plant in full sun. Height 5-6 feet, space 5-6 feet apart. Abeliophyllum Distichum Reseum - A very fine pink version of Forsythia. Not a dark pink but a pleasant soft pink that in our opinion is an improvement over the species. Adaptable to most well-drained soils. 3-5 feet tall, plant in sun or partial shade about 5 - 7 feet apart. 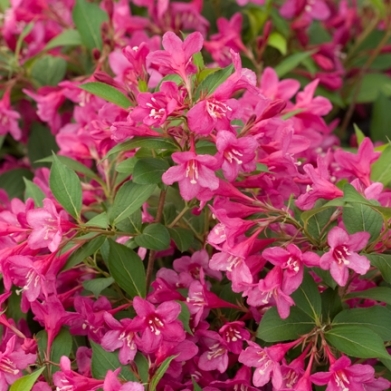 A beautiful low growing shrub offering from Proven Winners. Hydrangea Cityline Berlin is your answer if you are tred of floppy, weak stemmed hydrangeas, especially when they’re in full bloom? This new and improved hybrid from Germany has tight sturdy stems and excellent mildew resistance. This maintenance free plant will require no pruning and that results in more flowers the next coming summer. Its intense fuchsia color will pop in your garden and fill your home with beautiful fresh or dried cut flowers. The flowers age quite nicely into fall as well. Large pink summer flowers change to green with age. Compact. Disease resistant. Soil pH will affect bloom color. Prefers moist, well drained soils. Great landscape plant to add a dash of bright color. Good in groupings or masses, in a perennial or shrub border, as a specimen, screen, or hedge. Use in mixed containers and transplant into the ground in fall. 1-3 feet tall, plant 3-4 feet apart in sun or part shade. 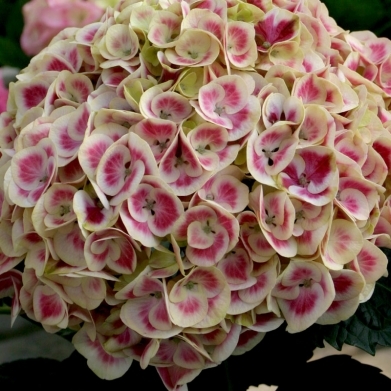 Another outstanding Proven Winner Selection the Hydrangea Cityline Mars. Features a small plant with strong stems and big, heavy magenta and white variegated flowers. The blooms are long lasting and can be changed from magenta-red to blue with the addition of aluminum sulfate to the soil. The flowers age to an attractive green with age. 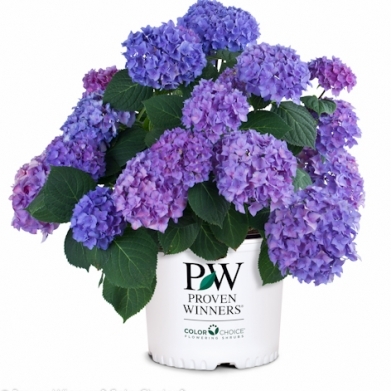 This compact, mildew resistant hydrangea is ideal for containers! Prefers moist, well drained soils. 1-3 feet tall, plant in full sun or part shade about 2-4 feet apart. A small to medium, Proven Winner early blooming selection with large flowers that range from strong blue to purple depending on the soil; add aluminum sulfate to the soil to encourage blue flower color. The blooms are large and long lasting. This plant has excellent mildew resistance, and makes a great container plant. A dramatic centerpiece for mixed container designs, Also great in mixed borders and perennial gardens. Prefers moist, well drained soils. 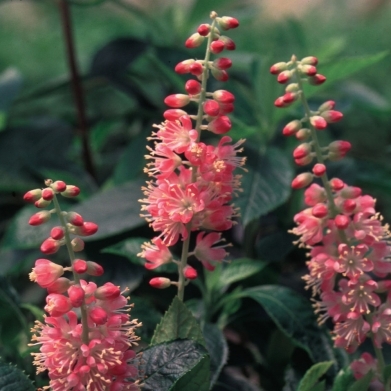 Height 2-3 feet, plant in sun or part shade 3-4 feet apart. 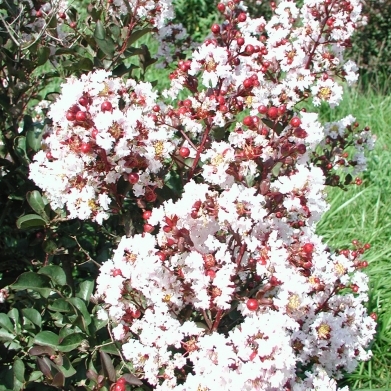 Large intense blooms with dark, pinkish-red flowers accented by a thin white line along the margin. This small to medium sized plant has strong stems and glossy foliage, and the flowers are good for cutting. Flower color can be pushed to blue with the addition of aluminum sulfate to the soil. Prefers moist, well drained soil. 2-4 feet tall, plant in sun or partial sun about 3-5 feet apart. 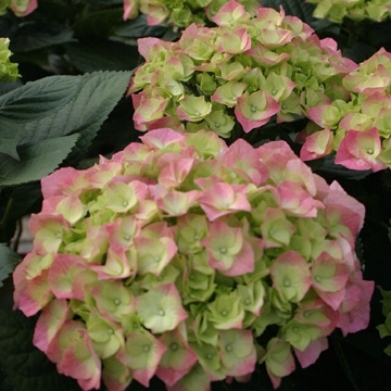 The Let's Dance Hydrangea series from Proven Winner represents the next generation of reblooming hydrangeas. 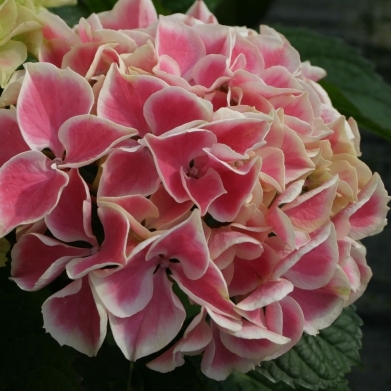 Don't settle for dull drab Hydrangea flowers - this series kicks up the quality with vivid flower coloration and attractive, glossy foliage. The Let's Dance series bloom on both new wood and old delivering seasons of flowers and lots of wow. 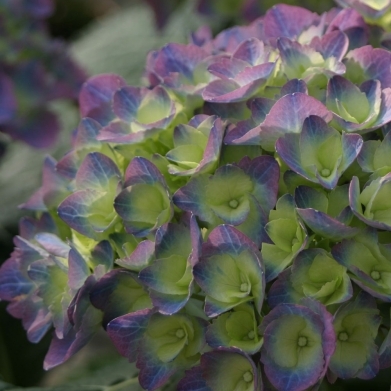 Moonlight is a strong growing reblooming mophead hydrangea with exceptional flower color. Soil pH affects flower color. 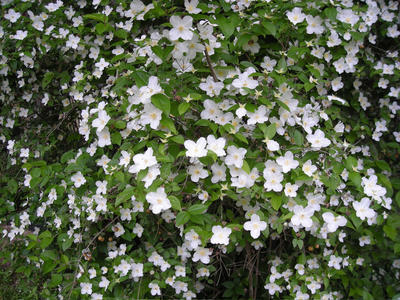 Great in landscape in a perennial or shrub border or as a specimen, screen, or hedge. Use in mixed containers, and as cut flowers. Prefers moist, well drained soils. Height 2-3 feet tall, plant in sun or part shade about 3-4 feet apart. The flowers of this latest Let's Dance reblooming hydrangea are truly amazing. The florets have a distinctive geometric shape, and are closely packed into full, richly colored mophead flowers. The reliable blooms are held up on sturdy stems, and a tidy habit and good wilt-resistance add to its appeal. The real show, however, is its easy shift from pink to rich amethyst-blue flowers by adjusting the soil pH. It has the richest, most vibrant blue seen on a hydrangea! Pink or Blue Summer flowers - an excellent rebloomer. Prefers moist, well-drained soils. 2-3 feet tall, plant in sun or partial shade, 3-4 feet apart. 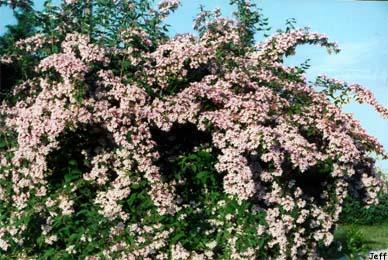 Also called Beauty Bush - Pink cloud produces white-pink flowers that are carried into May on arching stems. The bell-shaped pink flowers have yellow throats that appear in clusters in a profuse May bloom which persists for over 4 weeks. The flowers attract scores of hummingbirds. A member of the honeysuckle family, it is a deciduous shrub that typically grows 6 - 10 feet tall with broad-ovate dark green leaves as arching, vase-shaped stems, making an excellent specimen plant, hedge or screen. The flowers are followed by capsule-like fruit that usually persist on the plants, into fall, when the foliage turns yellow. In the winter, the bark exfoliates, adding winter interest to your garden. Plant in full sun for the best flowering, but it will flower less, in part shade, and the form may be more arching-spreading. This plant is deer, rabbit, insect, and disease resistant when planted in moist, but not soggy soil. 8-10 feet tall, with a spread of 6-8 feet. Innocence - perhaps the most fragrant of all Mock Oranges. Single pure white flowers, splashed with irregular creamy white and gold variegation. Snow Belle - a low grower with a compact habit loaded with fragrant pure white flowers. NATIVE of North America. This plant has lots of color! 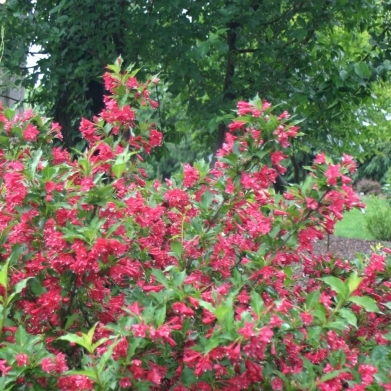 Bright neon red-pink flowers engulf this compact semi-evergreen azalea in spring. Vivid, glossy silver and dark green variegated foliage supplies the color the rest of the year. 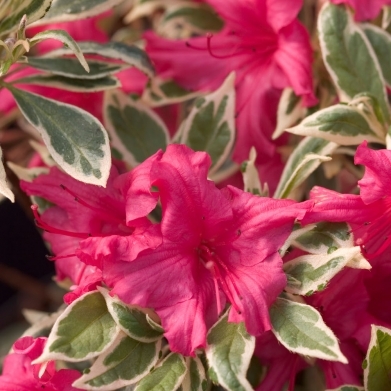 This very hardy azalea was developed by plantsman Mike Farrow of Maryland. Prefers acidic soils. 1 1/2 - 2 feet tall, plant in sun to part sun about 2 - 2 1/2 feet apart. Double Play spiraeas have both colorful flowers and colorful foliage. Massive pink flowers of a size never seen before adorn bright yellow foliage. This plant has the largest flowers we've every seen on a spiraea. Foliage glows orange in the spring. Adaptable and easy to grow, this is a great plant for landscaping. Tuck it into your existing mixed border or use it as a mass planting. 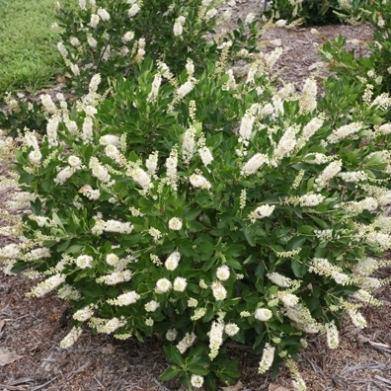 Adaptable to most soils, 2-3 feet tall, plant in full sun about 3 - 4 feet apart. An awesome plant for northern landscapes: a gold-leaf version of 'Tor'! Buds with hings of red in them open to white spring flowers. Sunny yellow foliage holds its color well, and the full, compact habit is very attractive. Also, it doesn't burn in the summer and has great fall color. If you're looking for a colorful, hardy plant that will look great all season, this is the variety for you! Adaptable to most soils this deer resistant plant will work great in mixed borders or foundation plantings. Height 3-4 feet plant in sun or part shade about 3-5 feet apart. Beautiful shrub with excellent contrast for your garden or border. 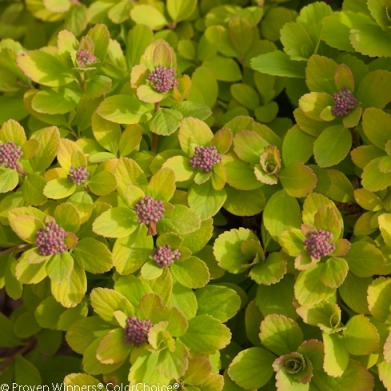 Sunjoy Gold Pillard features bright golden foliage with red new growth. A great vertical plant for formal landscapes. Little care is needed. Interesting columnar habit. Deer Resistant. Resistant to Sunburn. Prefers well drained soils. 3-4 feet tall. Recommended 2-3 foot spacing. From the breeder of Weigela WINE & ROSES® comes a new dwarf Weigela, MIDNIGHT WINE®. MIDNIGHT WINE is ideal for the front of the border or for edging the perennial bed. 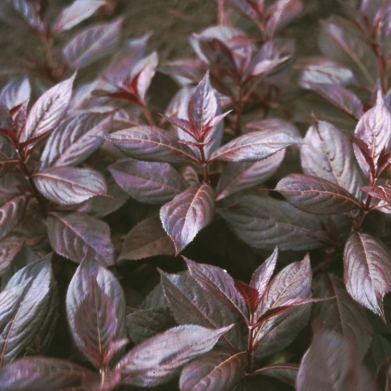 This tidy mound of dark burgundy-purple leaves can be used as an accent plant or a dramatic mass planting. 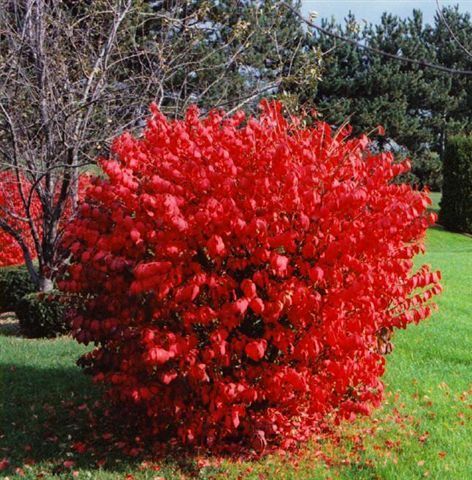 Consider using it instead of ‘Crimson Pygmy’ Barberry: MIDNIGHT WINE doesn’t have any thorns! MIDNIGHT WINE is maintenance free and needs no pruning because its habit is perfect the way it is. Just give it sun and water and you’ll have intense color from spring to fall. Pink spring flowers and dark purple foliage all season. Season-long color in this dwarf, deer resistant plant. Adaptable to most well-drained soils. Height 8-12 inches, plant in full sun about 1 1/2 - 2 feet apart. An excellent, dark red flowering variety with abundant blooms that resist fading. Adaptable to most well-drained soils. Height 4 - 6 feet, plant in full sun about 6 - 8 feet apart. The flowers open pure white with a yellow throat and then change to pink, giving you multiple colors on a single plant The flowers really pop against the bright green foliage. Blooms in May and reblooms until frost. Adaptable to most well-drained soils. 4-5 feet tall, plant in sun or partial shade about 5-6 feet apart. 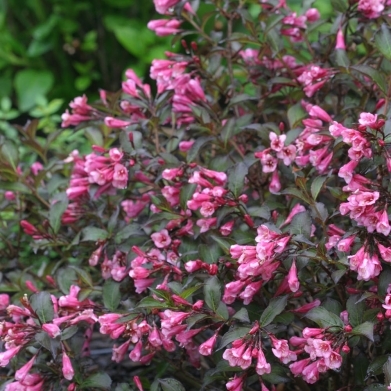 Like a fine wine this Weigela has good body! Its habit is tight and upright, and will not split in the middle. Its foliage color is similar to that of a fine wine as well - a nice,dark burgundy. No wonder the name is FINE WINE™. 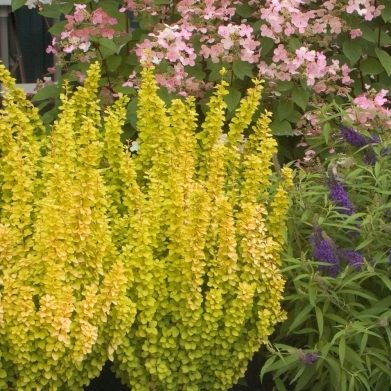 This shrub has wonderful presence in a container and the perennial border. 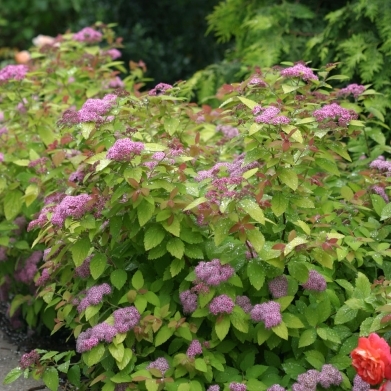 The pink flowers are extremely vibrant when set against the dark burgundy foliage and with slight shearing will re-bloom through out the summer. 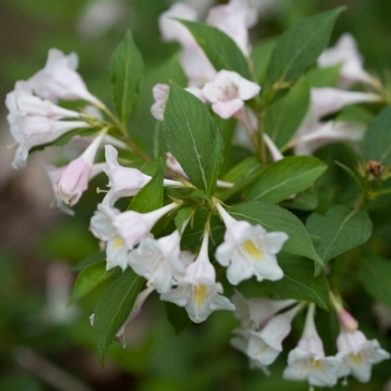 This improved variety should be first choice when you are looking for a Weigela that is between the heights of MIDNIGHT WINE® and WINE & ROSES®. Adaptable to most well-drained soils. Height 2-4 feet, plant in full sun about 3-4 feet apart. Loads of pink flowers in May are followed by waves of blooms until frost! Hot pink buds open to rich pink flowers in May and repeat until frost without deadheading. Adaptable to most well-drained soils. 4-5 feet tall, plant in full sun or partial shade about 5-6 feet apart.